Office Cleaners Edmonton | Border City Building Maintenance Ltd.
Having the right office cleaners in Alberta or Saskatchewan is essential for the well-being of your company. A clean, fresh appearance is more inviting for customers, which helps a business to retain and increase its load of clients. Having your building cleaned by a qualified cleaning service shows your clients that you have a concern for detail, meaning that your company will be more attractive to prospective clients. Whether you own or run a large business or small business, to have the right commercial cleaning business can help you maintain your offices and take your company to the next level. Here at Border City Building Maintenance Ltd., you can hire us with the confidence that we will be able to meet all of your commercial and office cleaning needs professionally, affordably and efficiently. At Border City Building Maintenance Ltd. we use only the most skilled janitors and cleaning professionals. When you hire our company to meet all your cleaning needs, you can be sure that you will receive only the best, most professional attention. Unlike other cleaning companies that might not offer a full range of quality building cleaning services, we work hard to make sure that our customers are always satisfied with our work. From post-construction clean-up to window cleaning, we can make your facility look spick and span. We can even clean upholstery and offer water damage restoration. To give you peace of mind, we’re bonded and insured. Whatever commercial cleaning you require, we can help! Contact Border City Building Maintenance Ltd. in Lloydminster or Edmonton today! We know the environment is an important matter that all of us need to focus on. That's why, here at BCBM, we strive to only use eco-friendly products that are green and biodegradable. Our goal is to satisfy your cleaning needs. If something goes wrong, we will take prompt and decisive action to fully resolve your problems as soon as they arise. 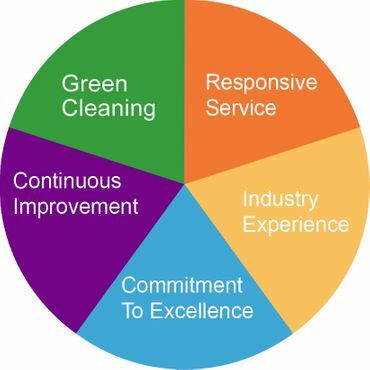 Our staff members are not only experienced professional cleaners, they also receive ongoing training through our unique Continuous Improvement Program. We hold our staff and all our operations to the highest standards of excellence. Our quality control processes leave our clients worry-free. With over 12 years of experience in cleaning commercial properties, we maintain the highest health and safety standards—not only for our staff but also for our clients.